Today's the day, folks. 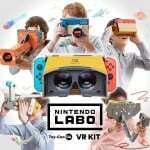 The Nintendo Labo VR Kit is officially out in the wild, available from gaming retailers and Nintendo's very own store. Yes, for the very first time, Nintendo Switch players will have the opportunity to experience virtual reality with specially designed games and activities. If you're still undecided on picking this up, or if you just want to learn a little more about it, we'd urge you to check out our full write up of our experience with the kit. Of course, we also have the promised Zelda: Breath of the Wild and Super Mario Odyssey functionality coming later this month, which could potentially be the start of a whole new way to play various Switch favourites. It's an exciting time, for sure. If you are wanting to get one for yourself, there are a couple of different options to choose from. The Starter Set offers a cheaper option, coming with just the Blaster Toy-Con, goggles and game to get you started, or you can treat yourself to the full shebang and get several more Toy-Con to play with. Will you be picking up the Labo VR kit today? Let us know if you're excited to try it out by constructing a comment below. Until VR actually gets good there will be no eason to get excited about it, plus this is worse than what's on the market. The only saving grace is the game designer. Cue happy kids but disappointed adults in 2 weeks time. Can anyone tell me if this works for people with glasses? I've seen some positive reviews and am interested in picking it up but if I can't wear my spectacles then it would just wreck my eyes. Look, Smithers, Labo is coming. On the new nintendo voice chat two hosts with glasses said they could use the labo vr with their glasses on. @SetupDisk Cheers pal, will give it a go in that case. Haven't downloaded this week's podacst yet, I always enjoy the show. @SetupDisk Very is already good, great even, and anyone claiming otherwise almost certainly hasn't used a headset like the Oculus Rift, HTC Vive or PSVR and played some of the best games on those headsets--such people really don't know what they are talking about. They are back to video on youtube and host actually puts it on over her glasses during the show. Stop it now, yes you bet on vr. Don't try to sell it like ever other article that even mentions it on this site. Paragraphs upon paragraphs of absolute drivel. @SetupDisk Nice one. The move to audio only didn't last long then! @Pazuzu666 Look, Nintendo Store links not Amazon links! Not for me. Maybe for my kids. It’s extremely lame that there’s no online sharing of VR game creations. Why do people compare this to other VR headsets like Rift and PSVR? This isn't competing with that market. At all. What VR needs is higher resolution, better viewing area and it needs to be wireless. Until then, I'll prefer Labo VR for much, much less money. I’m gonna give this a try to check out Zelda VR. Wish there was a basic kit with only the headset, but $40 for the gun pack isn’t too bad. This will likely be my only Labo purchase ever, and my first look at VR, albeit in a limted form. Hope they add support for Mario Kart VR. Parents, get your kids blind. Buy Labo VR. I was reminded when I received it at work. It's sitting next to me begging me to go home early. Also, how come buying everything separately is cheaper than buying the whole set? I know it's only £1 but you would expect the complete set to be cheaper, not more expensive. @Rhaoulos I never did check, but assuming it's cheaper b/c Nintendo charges for S&H on their website. I'm still curious if we can just buy the $40 set and kind of make our own contraptions for the others as supposedly there is no cart in the 2 $20 sets. Why do I have this feeling that everybody mocking this in the comments are the same people who said Switch could never do VR at all b/c it doesn't have enough power or high enough screen resolution. But here we are. Not expecting it to compete w/ my PSVR headset but for $40 we'll have some fun. Needs Link's Crossbow Training VR. Make it happen Nintendo. You already have the on rails engine in there, basically just gotta throw a skin on it. This is the most laborious VR in the world. @TipsySonic from what I've read the switch itself has gyro so it doesn't even need the joycons for that. When will some gamers realize that Labo is not targeted to them? It's meant for 7-12 year olds and it's not just about the software. I do not have much interest in VR since it still has a few kinks to be worked out but this one is interesting because of the construction aspect and it's a low price for entry. It's not meant to be Vive, Oculus, or PS VR so I have no idea why it's being compared to them. Due to the extreme low resolution, Labo VR will be a huge strain on the eyes (and brain) and young kids are not good in moderating themselves. Failed with adults so Lets now try and trick their KIDS into wanting it 5 years later. I’ve had mine this morning. Assembled goggles and lenses in about 20-25mins. Been mucking around with the 64 games that use just the goggles so far. Will build the other bits with my kids this weekend. First impressions are pretty good. These 64 mini games are a lot fun as you’d imagine and the kids will love them. The res is obviously low and the slight blurring with screen lag is noticable but once I start playing I’ve been too busy having fun to care. My arms are sore though. Been playing about 2h. Overall I’m very happy with my purchase and can’t wait to play with my kids. Why do you think Nintendo made it to where there was no strap to it? I would imagine most kids will only do this for an hour only at most. I believe most VR is fine after the age of 6 or so, I think the 3DS went through the same thing and that was 7 or 8 years ago. The higher resolution is important but again I believe Nintendo designed the art style in a way to get around this. @Moshugan agreed. They absolutely need sharing on the user made content. This could be the Mario Maker of vr. Without it, this is just a little peek into a world that could be soo much bigger. When/if they allow this, or have more games (Mario Kart, Pokemon Snap, etc) supported, I will get mine. @wratih9 you make a good point but still they continue with their rants. I don’t know what’s the matter with these people. Today was my first time using VR. But it wasn’t a game; it was training at work. Why’d they have to do it on release day? @SetupDisk This not a "bet". VR is 100% the real deal, and only people who haven't tried it or at best have maybe watched some crappy 360 video on Gear VR or something like that think otherwise. The difference is so profound that for someone like me I can't even play games like this is VR because it's TOO immersive. I am literally too terrified to play games like this in VR--that's how compelling and convincing the experience is. For anyone that hasn't tried VR yet is claiming it's no big deal--you literally have no clue. Perfect example, way to prove my point. I never said VR won't be exciting one day, I am sure it will, one day if if it gets good I will love it. Right now it can't compare to reality, not even close. That will take decades. It's great as a training tool for dangerous jobs and practice so it has merit. But for Resident Evil becoming so scary you can't even play it? Yeah drivel. I never tried VR? Who the hell are you? Of course I have tried VR. There are things called demonstrations that people use to sell things. Plus you are comparing VR, a concept across multi platforms which is basically still an add on to a ps4, pc or smartphone to buying a new console that doesn't release with lots of games? I'm sure you are Impurekid because you make a ton of assumptions and very little if any sense. I got the starter set today. I've only built the goggles and tried several mini games so far. I've got to say it looks better than I thought possible. Pretty impressive for a bit of cardboard. The mini games I've tried are very charming and have that classic Nintendo feel. The tablet itself has gyro so the joycon don't have to be attached. Most of the mini games only require one joycon to control so I can hold the goggles up to my face with one hand and control with the other. I'm really hopeful for a third party to make a headset with a strap, as I could imagine putting a lot of time into BoTW and SMO in VR. Overall, I'm very impressed so far with what Nintendo has been able to accomplish with VR on the Switch. I'm hopeful this is only the beginning. @LetsGoSwitch "I figure it's some guy's name. Some guy named Gabbo." @SetupDisk What utter garbage are you talking here? So, because VR isn't so convincing you believe it's actual [boring] reality then it's not great already? Following that logic every single Switch game, and indeed every game ever released, would fall short. I'm not sure you have the slightest clue what you're talking about here. I'm going to state something that I think is a fact at this point (at least based on what you're saying): You have not played VR. Now, assuming I am correct in that presumption, you should just shut up because you're making yourself look like an ignorant tool spouting utter garbage. And let me reiterate something here just in case you really don't get it: I'm not making stuff up when I say I literally can't play these horror games in VR because they're simply too terrifying in that medium. I booted up Resident Evil 7 on my bro's PSVR and literally could not leave the first room because I was given the utter chills just standing in that room with the rotten walls and stuff. I was actually unnerved standing there in that disgusting and oppressive starting room and didn't want to experience what came next. Watching it on a screen is not even comparable to standing inside it and seeing and "feeling" it all around you and really getting a sense of being in such a sinister place. He told me it was fine and nothing was going to happen in the next room, but I was so scared standing in that first virtual room that I couldn't go any further because I knew if a monster jumped in my face I'd probably rip off the headset quickly and likely end up breaking it or something. No game on a monitor has ever created that reaction in me before, horror or otherwise. Another example: I was playing a game called Face Your Fears in VR that had a part built around a fear of heights, and I was literally standing there with my legs physically shaking and almost buckling because the sense that I was standing atop a giant skyscraper on a tiny and unstable platform jutting out from it was so convincing and so compelling I was genuinely afraid. I intellectually knew I was safe in my house and standing on my living room floor; my inner brain had convinced itself I was in danger. That's not him just faking it; that's him believing it. And that kid at the end who was clearly very scared and upset just looking at a flat monitor screen--he would likely be traumatized for weeks if he'd been playing that very same scene actually inside VR. Again, you have no clue what you are talking about. And, just to clarify, it has nothing to do with these games looking photo-realistic. It is about a genuine sense of "presence", that feeling that what you are experiencing is actually real and right there in front of you in physical and tangible form, and that's true even when the world in front of you looks like a cartoon (it just appears like the cartoon is physically really there in front of you and all around you in full 3D). But you probably don't understand what I'm talking about because you don't get what it is that makes VR different to every single other medium that has come before it. You will though--and then we can both celebrate the next paradigm shift in gaming and entertainment. @Jeronan 3D and VR being bad for children's eyesight has been debunked several times. There is no evidence that it causes any issues. Several optologists have come out to say it can actually help a child develop better depth perception. @SetupDisk Regardless of what you think, the overwhelmingly majority of people that try VR have fun and see the potential. Most people don't buy in because of cost, content, setup difficulty, comfort, etc. But when they are actually using it, it's almost always met with enjoyment. And if you think it will take decades for it to be where you want it to be, you've spent zero time doing research as to how fast it's progressing. Had a little extra money on my check this weekend and went to buy one. Neither Wal-mart nor GameStop even got any delivered. Don’t feel like ordering it. I would say I’d wait to try a friend’s, but I’m usually that friend that everybody else relies on to buy and try stuff out. I'd like to call this the spiritual successor to the Virtual Boy. I’m stoked for this. I had to cancel my preorder because this weekend I’m playing “brakes and rotors.” Fingers crossed I can unlock the “passes inspection” achievement. I hear the game really opens up after.